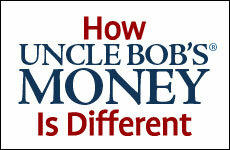 Here are eleven critical differences that set Uncle Bob's Money far apart from all the others. (1) We don't allow emotions to interfere with investment decisions. By meticulously evaluating risk through a step-by-step process, we see where potential profit is high and risk is limited as well as known. It's the same way insurance companies turn a consistent profit: by analyzing data, arming themselves with knowledge, and proceeding with calculated risks. When you invest in stocks, you're generally dealing with even odds: it'll either go up or go down. The methods we use at Uncle Bob's Money, on the other hand, increase those odds from 50% to anywhere from 68% to 99%. Our strategies protect your investment by keeping a firm awareness on the risk involved so that loss is limited and gains are steady. We use extremely detailed and well-developed checklists in managing and monitoring investments. They are set up to run automatically through our system, constantly updating and displaying the status of every item you want to watch. This saves you from having to keep track of what to check and what—and how—to calculate. (4) You have the reins on your money. We don't control your account—only you do. It stays under your complete control, 100 percent of the time. (5) We concentrate on what you need to know. Rather than bombarding you with endless what-ifs and stuff that really doesn't apply, we focus on what's critical for your immediate needs. For instance, in our Trade Finder we do the culling for you and only show you trades that fit every one of your investment criteria. We also highlight key trading factors, such as which yields the highest. Here's an example: On a Condor trade, we'd highlight your short strike's Delta value, as well as showing the suggested exit point and adjustment point. Psychologist Paul Andreassen did an experiment with MBA students at MIT Sloan in the late 1980s. He asked each student to pick a stock portfolio and then divided them into two groups. The first group could only see whether their stocks went up or down, leaving them with nothing else to base trading decisions on. The second group had access to abundant financial data from all the usual sources (The Wall Street Journal, CNBC, Analyst reports, etc.). The results were telling: Group A, with its very limited information, earned double what Group B did, with its full access to data. It seems the additional information just distracted them with rumors and speculation. The human brain isn't meant to process that much at once, and it naturally focuses on the irrelevant. Uncle Bob's Money gets you around that by displaying only necessary information on the Trade Finder and Trade Monitor pages. (6) There's no cost to learn. Our teaching and training materials are free, and you can get them even without registering. (7) We don't go forward until the checklist shows a green light. Investing isn't about staying in motion; we only make trades when it's the smart thing to do. Our job is to make money for you, and that can mean sitting still in a turbulent market. It's about how much money you keep—not how much money you move around. The profit—and not the quantity of trades—is all that matters. (8) The stock market is unpredictable—and we know it. That's why we don't get involved trying to guess which way it's going: hunches are usually wrong, and they surely don't provide consistent gain. Wouldn't everyone like to have special powers? Well, we aren't in this to pretend that we do. But that randomness of the market leads us to steady returns, since we play off its ups and downs through non-directional trades. (9) We use careful evaluation of risks to determine limits. We've mentioned insurance companies before, and how they use data analysis to limit loss, ensure gain, and determine premiums in order to make a profit. We exercise similar loss control, putting limits and stop-orders on positions. In the same way an insurance company wouldn't write a policy for a teenager with a Ferrari because the premium could never offset the risk, we don't gamble. We avoid low-probability or speculative positions in favor of predictable, consistent gains. (10) We show how options prices will change in a changeable market. Our True Price® graphs clearly display how actual options prices are going to change in a fast-moving market. This increases accuracy in setting contingent orders and protects you from further loss should the market jump. (11) We provide a full Options Strategies toolkit. Just as a golfer has a specific club for each kind of shot, varying market conditions call for specific options strategies. We offer four, and you can choose whatever ones you like. When you follow the same patterns and make the same decisions the same way as the person before you, you're very likely to get the same results they got. This covers basically everything in life, including trading. Does it make sense, then, to follow stock and mutual fund investors to a pattern of value swings and portfolio losses? 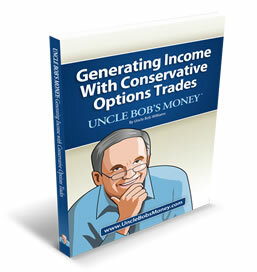 At Uncle Bob's Money, we develop our strategies under the guidance of sharp and savvy market makers and pit traders. They're results-oriented, making large profits time after time. Wouldn't you like to benefit from their know-how, experience, and abilities? Similar profits can be yours if you follow their proven pattern—and there's no better time to start than right now. Have a Question? Comment? Suggestion? Stability and portfolio growth in all market conditions. HAS UNCLE BOB'S MONEY GONE ABSOLUTELY BONKERS? Why in the world would we reveal our proprietary trading secrets rather than stay tight-lipped and simply keep all the money for our own trading account? Don't even think about trading without meticulous preparation. None of the Operator Parties are providing investment, financial or legal advice, and nothing on this website should be construed as such by you. The website should be used as an educational tool only and is not a replacement for licensed investment advice. You should seek advice from an independent financial advisor if you have any questions relating to the information found on, or your activities in connection with, this website. Copyright © 2019 Jumping Ahead, Inc.